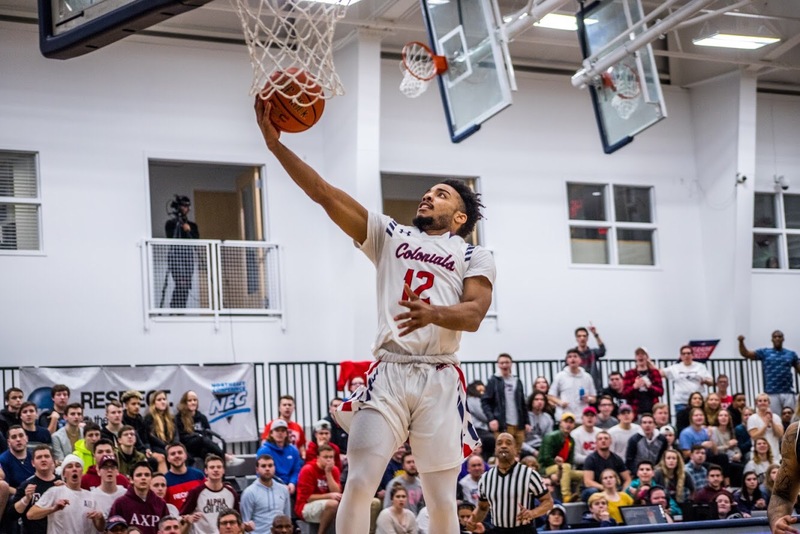 MOON TOWNSHIP — The Robert Morris Colonials (13-12, 8-3 NEC) fell to the Central Connecticut State Blue Devils (11-4, 5-7 NEC), 77-68. The first half started off slow. The scoring was opened up by CCSU’s Deion Bute nearly three minutes into the game. The low scoring was due to the fact that both teams were drawing offensive fouls. The whistle blew against the Colonials eight times in the first half. The combined scoring went over the double-digit mark when Robert Morris’s Malik Petteway made both free throws with a little over 12 minutes remaining in the first half. In fact, Petteway came off the bench on a mission. In just four minutes of work, the senior had four points and added a rebound. Josh Williams started to heat up late in the first half. Williams, who earlier in this year tied the record for most three pointers in a NCAA game, made back-to-back triples as the Colonials tried to cut into the Blue Devils’ seven point lead. Then the buzzer sounded for half time as CCSU led RMU by a score of 31-26. Williams and Dante Treacy each had eight points and two rebounds going into the locker room. The Blue Devils’ were lead by Tyler Kohl with 15 points, and Deion Bute who hulled in eight rebounds. The Colonials flipped the script on Central Connecticut in the second half. Robert Morris went on a 18-9 point swing. The point spark was lead by the heartbeat of the Colonials. Matty McConnell stepped up when RMU needed him the most. McConnell got the crowd at the NAC rocking with an up-and-under layup. He also drew a foul on the play. McConnell led the comeback. In order to complete the comeback, the NEC leader in steals per game had to live up to his title. McConnell’s steal and score was all Robert Morris needed to take a lead for the first time since before the 10 minute mark in the first half. The Blue Devils didn’t go quietly into the night. CCSU rode the back of, potential NEC Player of the Year, Tyler Kohl. Kohl led his Blue Devils to a five point lead with less than two minutes to go in the game. Kohl lead all scores with 23 points accompanied by seven rebounds and five assists. CCSU’s Joe Hugley, Ian krishman and Dein Bute also finished in double digit scoring. Bute finished with a double-double with 11 points and 11 rebounds. Malik Petteway finished his night with 16 points and seven rebounds. Josh Williams tallied 12 points in the losing effort. Charles Bain and Dante Treacy each poured in 10 points. Robert Morris has now dropped three of their last four games and head coach Andy Toole had this to say about the loss. The Colonials will look win in Maryland when they take on Mount St. Mary’s (6-19, 3-9 NEC) on Thursday, February 14. Tip-off is set for 7:00 p.m.